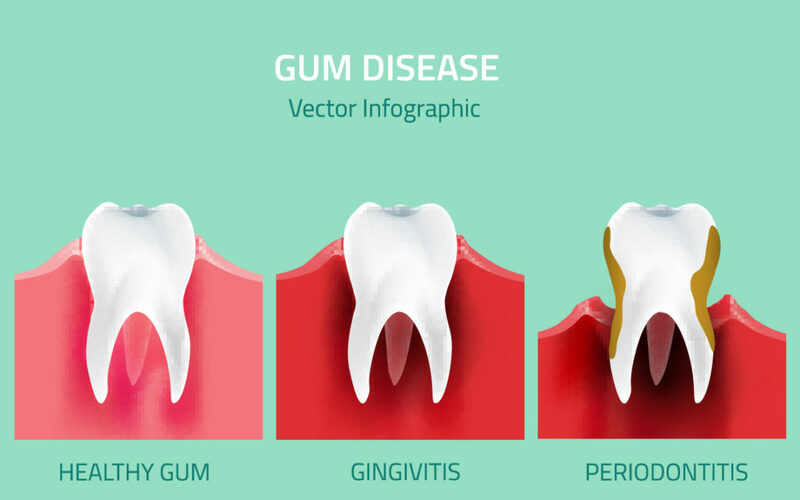 How Does Gum Disease Affect Your Overall Health? Having great dental hygiene isn’t just important for the condition of your gums and the strength of your teeth—it’s also important for your overall health. Studies have shown that people with poor oral hygiene and gum disease are more likely to suffer from a wide variety of conditions—some of which can be life-threatening and even fatal. It may be hard to believe, but your mouth, teeth, and gums have a direct link with your body’s cardiovascular system. When your gums become inflamed, they can develop tiny cuts and openings. And because gum disease is often associated with excessive bacteria, the germs in your mouth are free to travel through your bloodstream where they can enter the arteries of the heart, contributing to atherosclerosis—or the thickening of the arteries. That can significantly increase the risk of a heart attack and stroke. A recent study discovered that people with gum disease have a higher risk of cognitive decline and conditions like dementia and Alzheimer’s disease. According to research, bacteria associated with gum disease enters the bloodstream during activities like eating and brushing. The bacteria can travel to the brain, resulting in an immune response. Eventually, that response can cause changes in the brain’s structure, leading to conditions like dementia and Alzheimer’s disease. If you’re diabetic or at risk of developing diabetes, it’s extremely important to maintain excellent oral health. People with diabetes are already at risk of developing severe cases of gum disease, and gum disease itself is a risk factor for causing poor blood sugar levels in diabetics. A recent study found that people who have diabetes and gum disease are six times more likely to have trouble controlling their blood sugar levels than diabetics who don’t have gum disease. At advanced stages, gum disease can result in the loss of teeth and reduced bone density. Over time, the bone density can become so low that the bones around the mouth and in the jaw become weakened, fragile, and brittle. The complications associated with bone loss in the mouth and jaw, as well as the inflammation and bleeding that occurs during advanced gum disease, can cause sufferers to be at risk of developing severe infections and a reduced ability to eat and speak. View Our Periodonitst Treatment page. The best treatment for gum disease and all the conditions associated with it is preventative care. At 101st Adult Dentistry, our dental team will give your mouth, teeth, and gums a comprehensive checkup and cleaning. We’re also available to meet any of your other dental needs, including implants, extractions, and cosmetic procedures. Call us today at (931) 906-8800 to schedule an appointment. What Should You Do If You Have a Dental Emergency? Can Winter Weather Cause Sensitivity and Toothaches? Can Cold and Flu Remedies Impact Your Teeth? 101st Adult Dentistry welcomes patients with disabilities. If you need an accommodation to receive dental services, we would be happy to provide one. Please contact us at 931-906-8800 to let us know how we may be of assistance.